REDDING, Calif. - The community is invited to free performances Friday and Sunday of a “Welcome, Christmas” program featuring the Simpson University Chorale, Trinity Repertory Singers, and Weaverville Community Chorus and Orchestra. 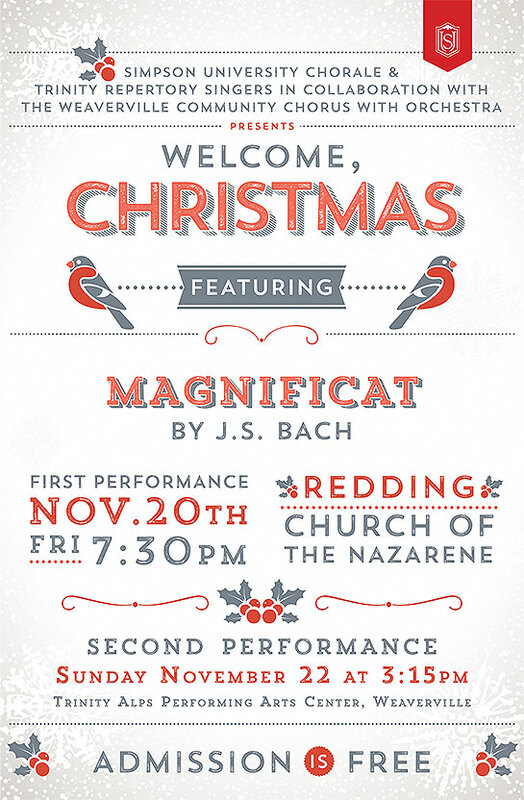 Friday’s performance is at 7:30 p.m. at First Church of the Nazarene at 2225 Bechelli Lane in Redding. Sunday’s performance is at 3:15 p.m. at the Trinity Alps Performing Arts Center in Weaverville. 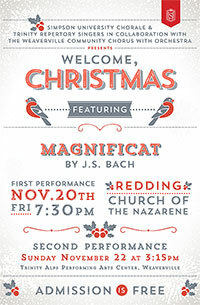 This special pre-Christmas program will feature J.S. Bach’s “Magnificat,” Mechem’s “Seven Joys of Christmas,” and other lively carols, under the direction of Dr. Cyril Myers Jr., assistant professor of choral studies at Simpson University. For more information about upcoming Simpson University Music Department events, visit simpsonu.edu/musicevents.